To mutilate the word’s of Stephen Foster “I went to Alabama with a banjo on my knee…” The words were in my head and though the instrument in which I was interested wasn’t a banjo, I was going to Alabama to the 2nd ISA Automation week which was held in the old town of Mobile on the shore of a shimmering bay. It was my first visit to the state and the city and I was impressed by several things. The city itself was old and manageable, the people were friendly and the conference facilities were worthy of a city three times the size. Indeed better than most. Having had some misgivings after the 1st Automation Week in Houston (see our blog Debacle or basis for development? Oct 2010) it was with some anxiety that attendees and especially exhibitors braved the sometimes convoluted skyways to the small Mobile Regional Airport. They needn’t have had any worries. A resurgent ISA rose to meet that challenge and turned a fairly large and influential band of critics to acknowledge the success of the effort. 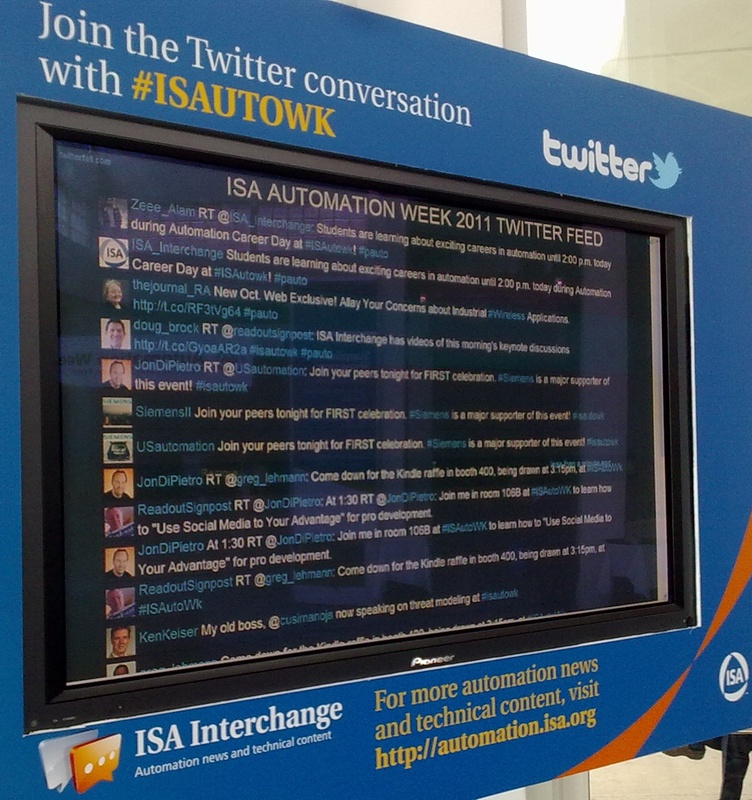 The event learned many lessons from the first Automation Week. The Exhibition Area was open all day for a start instead of the “better than my job’s worth” closing during the conference sessions. This facilitated casual visitors and indeed interactivity between the booth personnel. The site was WiFi enabled throughout and this connection was free with no fussy procedures like registering or passwords. A daily e-newsletter was published each day of the event! Another departure was the provision of an electronic Automation Week Daily comprising reports and impressions for each day. This was largely the work of volunteers and InTech & Automation.com staff, who fed articles to the professionals for formating. Sterling work here by Emily Kovac who sat patiently over a hot computer in the press room receiving the work of the writers. One of these was a Tribute to Greg Shinskey which consisted of a panel lead be Nick Sands comprising Greg McMillan and Terry Tolliver, ISA Fellows, who both gave examples of how their lives in automation were influenced by Shinskey. This tribute included the first screening of an exclusive interview by Greg McMillan of Greg Shinskey on his latest thoughts on how to make the most of the PID controller for improving process efficiency and capacity – Shinskey and the Best of Process Control. The keynotes had Charlie Cutler on the first morning talking on “The Status of Real-Time Optimization and Multivariable Predictive Control” and held a full hall enthralled for the duration of his talk. Though hardly an exciting speaker in terms of delivery the quality of the content held everybody’s attention. On day two there was a formidable “all star” panel of experts representing a probable four or five hundred years of cumulative automation knowledge at the one table (see pic)! This gave a fascination vision of each experts perceptions of the past and looking forward to the future of automation. They shared their knowledge which they considered essential for advancing the use of process automation and optimisation. We gained insights on the best existing practices and new possibilities for the use of process automation and optimization for improving individual unit operation performance and overall manufacturing efficiency and capacity. The keynote for day three was the incomparable Béla Lipták. This was to include a description of the latest developments in industrial automation, covering sensors, valves, controllers, optimization of unit operations, safety, and displays. His explained how the control and modeling techniques developed for industry are also applicable to build models for non-industrial processes. A copy of his presentation was given to each attendee and as his talk could have lasted a number of hours he indicated in advance those “slides” he would be using and those which we could study ourselves later. Would that all presenters were as considerate! More than one participant remarked on the professionalism and the quality of content. All in all it was in the strong ISA tradition of utilising the volunteers unique knowledge and experience to provide top-class and useful information and techniques for use in the application of modern automation in process and manufacturing. conference “path”—suited to individual job function and professional goals. Technical tracks were designed to provide in-depth knowledge of various subject areas through comprehensive presentations and tutorials. Each sesion was catagorised under one or more of the following headings: Engineer, Technician, Management, Marketing and Academia/R&D/ Scientist. The only real complaint we have heard is the fact that the proceedings were not available and would not be available for some weeks. There were other peripheral events too like the Honours & Awards Gala on the Monday evening where the society honours the great and the good of the Automation world. This year the societies highest honour was bestowed on Andy Chatha, President and CEO of ARC Advisory Group who was made an Honorary Member. the efforts of ISA Technical Division Volunteers and Officers at the Joint A&T and I&S Awards Luncheon. That evening a short ceremony and buffet to honour authors in ISA publications including InTech, ISA Transactions, Papers and Standards. A further lunchon on the Wednesday recognised the ISA’s Analysis Division leaders and paper authors. There were two events on the show floor on Tuesday night. 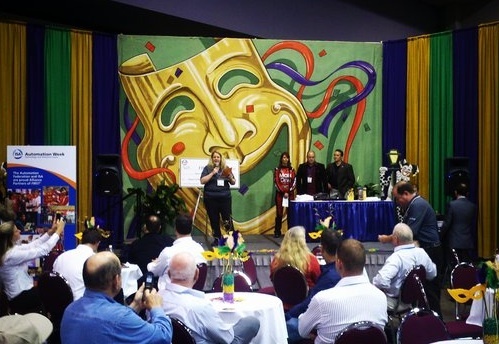 The Divisions Spotlight Showcase was one Membership in ISA Divisions connects members to a global network of professionals with their technical and/or industry interest. Vistors met new professional colleagues and reconnected with other industry professionals who share their interests, in a casual, fun environment. A firm celebration at ISA events through the years has been the YAPFEST, where attendees—young automation professionals (YAPs) and college students interested in careers in automation meet and share positive experiences about being a part of a professional society like ISA. The ready availability of WiFi meant that people were able to share experiences with the the Automation Community unable for one reason or another. Attendees were encouraged to tweet their comments and experiences. Indeed it was an opportunity for inveterate tweeters, who had become firm friends though they had never met. Thus this correspondent while making his way to the first keynote received the following tweet on his phone, “Am at the back of the hall working on my presentation, where are you?” It was from @jimcahill, Emerson’s éminence grise of the internet and Emerson Process Experts Blogger. I was finally able to meet him and tell him how to pronounce his name properly! A flurry of tweets followed between us and many others in the hall and gradually a steady of tweets eminated from the various sessions and from other outside. These were relayed to all and sundry on a special tweet screen in the Conference Centre. In short to quote @greg_lehmann “Fun and Informative ‘real’ times were had tweeting at #ISAutowk see you next year in Orlando!” The term “Predatary Tweeter” was coined and a suggestion made for the design of a new tee-shirt bearing this epithet! The intrepid work of Jon DiPietro, who also delivered one of the sessions in Using Social Media to your Advantage on Personal Inbound Marketing, ensured that some of the presentations were livestreamed or recorded on video for those not present or for looking at at a later stage. These may be found on the new ISA Interchange Livestream page. We look forward the Automation Week 3 next September in Orlando, Florida (USA, 24-27 September 2012). It has a lot to live up to and under the gifted programme chairmanship of Dr Peter Martin I am sure the Mobile event will be equalled if not exceeded. This entry was posted on Monday, October 24th, 2011 at 11:15 am and is filed under Associations, Automation, Events, Process Automation, Training/Education. You can follow any responses to this entry through the RSS 2.0 feed. You can leave a response, or trackback from your own site.